Tonight I attended Cooking Up Change. It’s an event where high school students create a school lunch meal for $1.00 per serving and then compete to earn a spot in the national contest in DC. 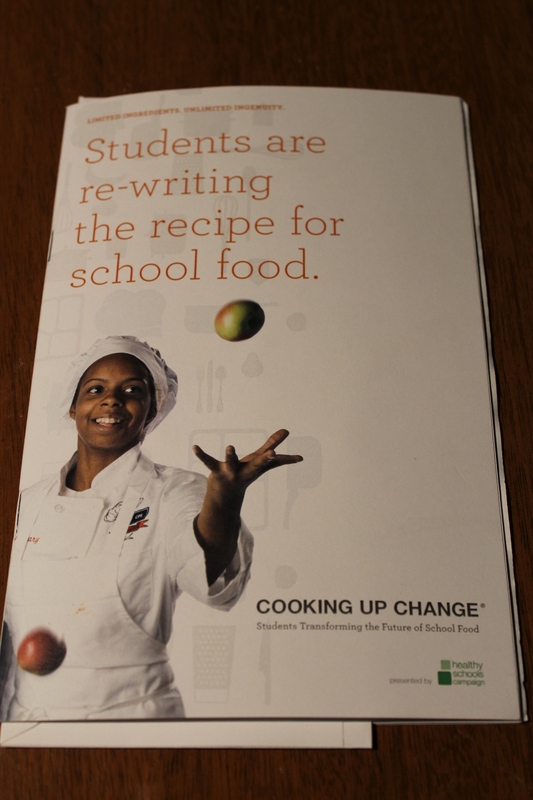 I was able to chat with every single team (12 teams from 12 different high schools from Chicago Public Schools participated) and find out more about how they developed the recipes. I was impressed by their food knowledge and their enthusiasm — as well as the food! Next week I’ll write a post on my experience and share pictures of the creative and delicious school lunches that the students created. For now a photo of my program will have to suffice because I’m exhausted! So nice that students are exposed to career possibilities that are creative and fun. Good for you to be involved! It was very nice to see you are very involved in helping schools lunches. I’m a high student and our lunches have upset my stomach before. I’m sure students would do anything to have a better lunch that actually fills them up!